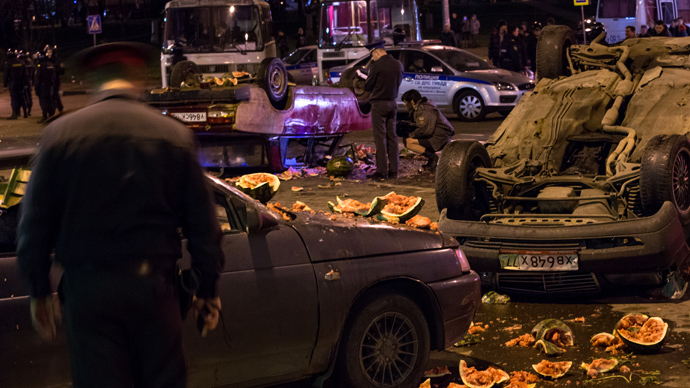 Moscow police detained some 380 people during the mass rioting in a southern district of the city. A mixed crowd of nationalists and locals attacked a warehouse run by natives of the Caucasus, blaming a migrant for the fatal stabbing of a local. Authorities lifted the emergency plan codenamed “Volcano” after midnight, several hours after public order had been restored. The plan, put into effect in the afternoon, involved sending scores of riot police to the scene of the clashes, and placing police officers across the city on high alert. By midnight the streets were practically deserted, except for police officers and a couple of bystanders discussing the day’s events. Meanwhile the 380 detained during the unrest were being interrogated in a criminal case over hooliganism – thus far as witnesses, police said. A crowd of people on Sunday broke into a vegetable warehouse in the southern district of Biryulyovo, hurling rocks, smashing up stalls and vending machines. While the police estimated the crowd at about 350 people, witnesses at the scene suggested the number of rioters could be as many as 1,000. Some of the most aggressive participants of the unrest clashed with riot police and attempted to block the street after several people were detained and forced into police vans. A cordon of about 200 riot police failed to block part of the crowd from rushing in the direction of the warehouse. The violent scenes came after a similar rampage took place at a nearby shopping center, where the rioters had originally gathered. The outraged crowd demanded that the police find the killer of a 25-year-old Russian, who was stabbed to death on Thursday allegedly by a man from the Caucasus or Central Asia. The locals also lashed at the the authorities, accusing them of covering the wave of migrant crime and the illegal immigration in the area. Ethnic tensions in Moscow have been high on politicians' agenda in recent months, with the issue of illegal migration a key theme in the city's mayoral election last month. 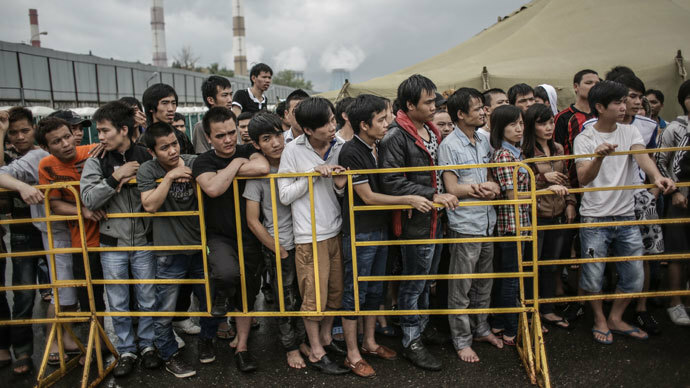 Scores of migrants from former Soviet republics in Central Asia and the Caucasus live in the city, many working in low-paid jobs in food markets without legal residency permits. 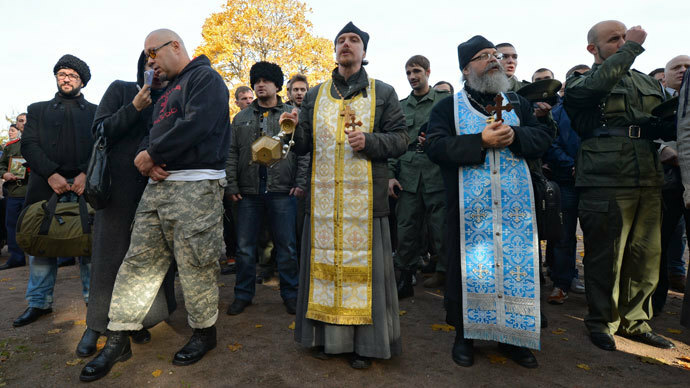 The city's ethnic dividing lines are also overlaid with religious ones, as the Russian Orthodox majority is challenged in many neighborhoods by a growing Muslim population - both from Russia's North Caucasus and from outside Russia's borders. On Sunday, media reports said that the police did not interfere while a crowd of rioters looted the warehouse and the mall, but later started to arrest those who remained on the scene. RT’s Lucy Kafanov reported that the situation in the district was largely settled by nightfall. However, later on Sunday some 300 people gathered near the devastated shopping mall and reportedly tried to block the nearby road again. The mob began to hurl bottles at riot police after they attempted to prevent the action, said a Ridus.ru correspondent, who was hit by one of the bottles. Police also used helicopters to monitor the situation, RIA Novosti reported. The situation remained tense throughout the whole district, with police sources telling Interfax that a fight between a group of football fans and a group of men from the Caucasus broke out amid the riots. Five people have been taken to hospital with various injuries following the incident, and one more injured person refused to be hospitalized. Police authorities said 5 riot police officers were wounded in the clashes, including a battalion commander. At least 11 other people sought medical help in connection with the riots, medics said, adding that none of them were seriously injured. Residents of the Biryulyovo district in southern Moscow took to the streets following the fatal stabbing of Egor Shcherbakov, a Muscovite, earlier in the week. Late on Thursday evening, when Shcherbakov and his girlfriend were on their way home, the young couple were attacked by an unidentified man who stabbed Shcherbakov with a knife. 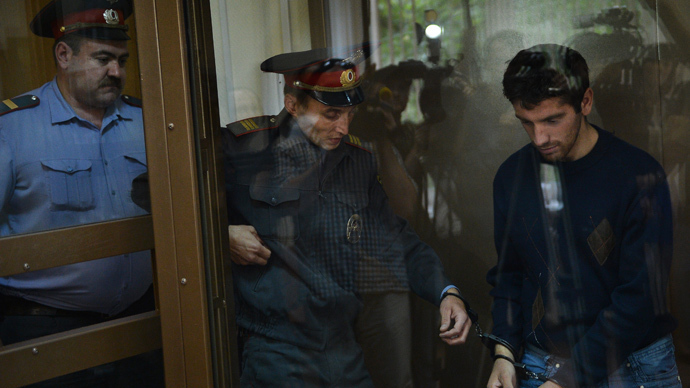 Shcherbakov’s girlfriend described the attacker as a male native of the Caucasus and said that he had assaulted her boyfriend after trying to harass her. On Saturday a group of about 40 people gathered for a protest in the area, urging the police to find and punish the attacker. They demanded that the district’s police chief resign, and that a local vegetable warehouse, where many migrants work, be closed. However, the protest was followed by an unsanctioned rally on Sunday, which turned violent as hundreds of angry protesters attacked a shopping mall – attempting to set it on fire and breaking windows. A group of people among the crowd reportedly broke into stores, ransacking them and looting goods. Several police officers were injured by bottles thrown by protesters, while an elderly female relative of Shcherbakov’s narrowly escaped being hit by one of the bottles. Protesters demanded that all the suspected rioters detained by the police should be freed, and ignored police attempts to calm the crowd. Police told the crowd to disperse, as the protest was not sanctioned by the city administration, as required by law. However, the crowd refused to disperse. Chanting nationalist slogans, protesters attempted to block a road and turned over vehicles and dumpsters, before heading to the vegetable warehouse. Witnesses said that many of those taking part in Sunday’s riots were members of radical nationalist groups. Egor’s girlfriend said she was against such protests, since she did not want “interethnic conflicts” to be inflamed. “I know this crime won’t remain unpunished,” she told Moskva 24 TV channel. The Russian Investigative Committee on Sunday said that its leading criminalists, as well as the most experienced Moscow police field officers have joined the investigation of the case. More than 90 people have been questioned in connection with the killing, the Committee added. Moscow police promised to pay up to one million rubles for information that would help to identify and find the murder suspect. Some 80 illegal immigrants were also detained as the search for the murder suspect unfolded. Meanwhile, authorities in Moscow’s Southern Administrative district have decided to set up an operation headquarters to counter illegal migration. The body – comprised of police, federal migration service representatives and voluntary people’s guard – will gather daily. The new foundation will focus on identifying flats rented to illegal migrants, patrolling streets and organizing sweeps on reports from citizens, the prefecture’s press service told Interfax. Police have closed public access to Moscow’s central Manezhnaya Square and increased presence in nearby streets. Law enforcers used metal fences to cordon off part of the square above the underground the Okhotny Ryad shopping center – a popular place among Muscovites and tourists, particularly on weekends. According to RIA Novosti, the situation in the area is generally calm and so far no aggressive groups have been noticed. Earlier, some activists used social networks to urge Biryulyovo protesters to come to Manezhnaya square, which was the site of one of Russia’s worst nationalist riots almost three years ago. 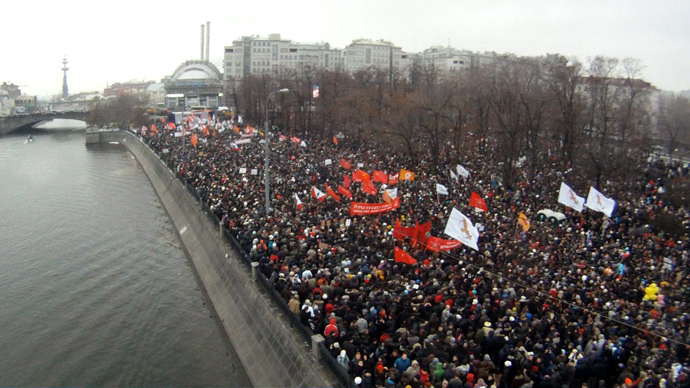 On December 11, 2010, about 5,000 football fans gathered on the square near the Kremlin to commemorate the death of a Spartak Moscow supporter, Egor Sviridov. The 28-year-old was shot dead in a brawl with a group of men originally from Russia’s North Caucasus. However, what started as a peaceful protest turned into a violent rally as soccer supporters and nationalists clashed with police. Dozens of protesters were detained. Following the Manezhnyaya Square incident, authorities stepped up the fight against extremism and xenophobia. The government has also toughened punishment for organizing illegal immigration. However, the situation still remains tense in Russia - home to about 185 different ethnic groups. Just in July, residents of the south-eastern town of Pugachyov staged mass protests demanding that ethnic Chechens be forcefully removed from the area after a local Russian man was stabbed to death, allegedly by a Chechen teenager. Domestic migration has been on the rise in recent years, which often leads to inter-ethnic tensions. Millions of immigrants also come to Russia from former Soviet republics seeking work and better life. According to statistics announced in spring by the Federal Migration Service, there are over 3 million illegal immigrants in Russia and 11 million legal visitors. However, unofficial estimates put the number of illegal immigrants at 10-12 million.